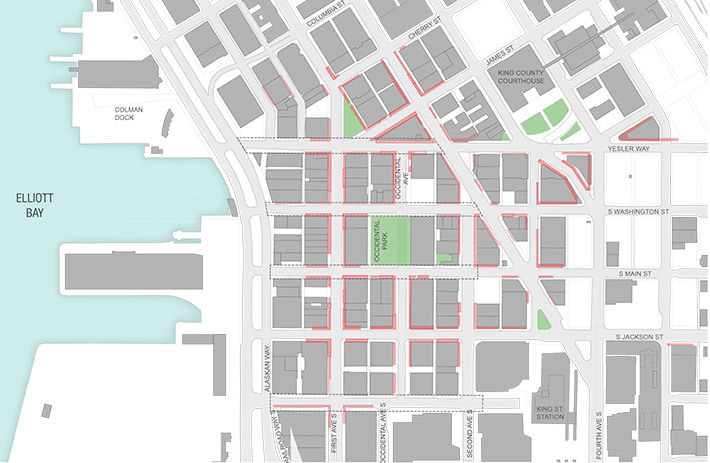 Welcome to the Pioneer Square East West Pedestrian Improvements project online open house. 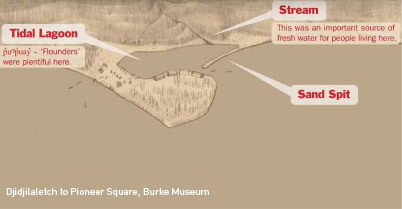 Look for the speech bubble icon for opportunities to comment. 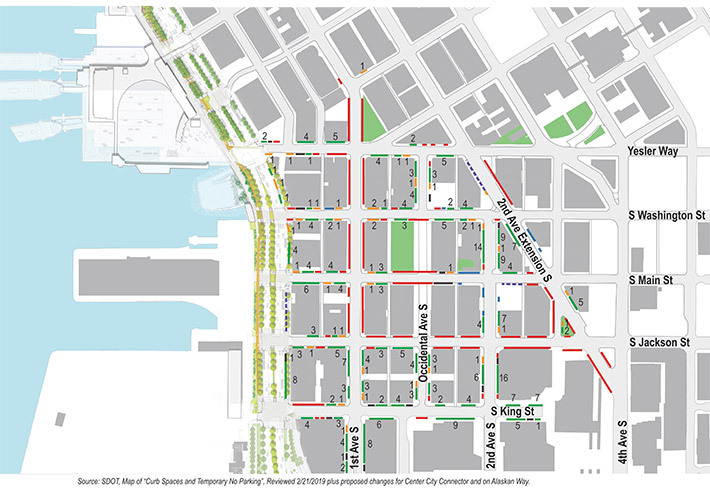 The City of Seattle’s Office of the Waterfront & Civic Projects, working with community partner Alliance for Pioneer Square, has begun an effort to improve east-west streets in the heart of Pioneer Square. 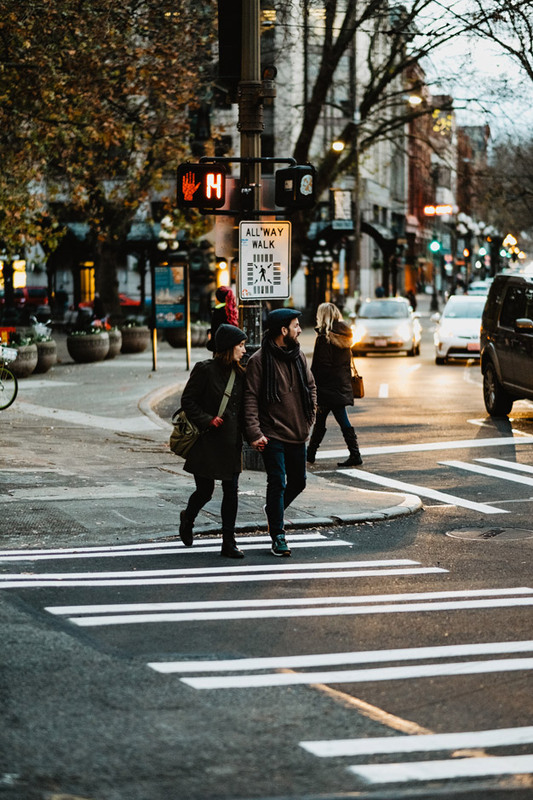 This project will design and construct improvements on portions of Main, Washington, King and Yesler streets between 2nd Avenue and Alaskan Way. 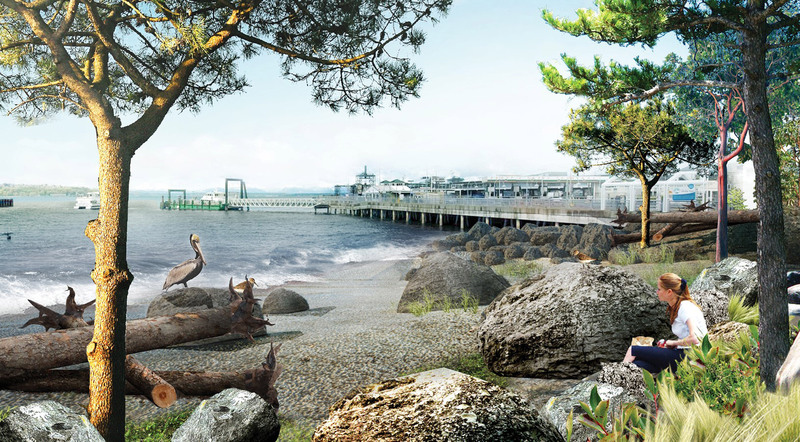 There is a total budget of $20 million for all project costs including design, permitting, construction and management. 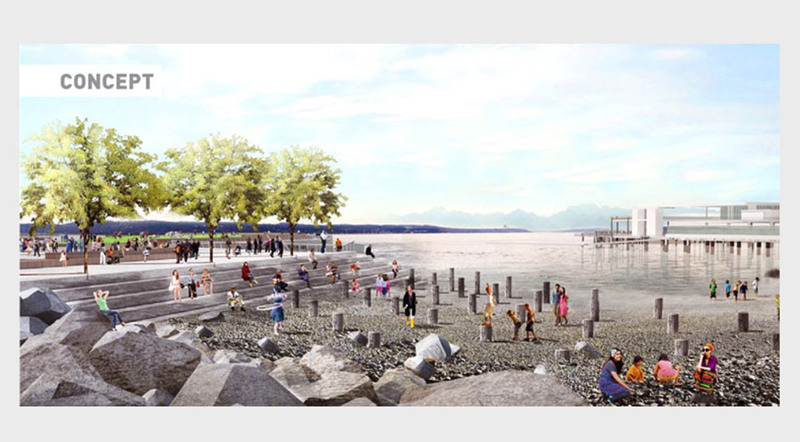 The project is primarily funded by the Waterfront Local Improvement District (LID) and is supported by other City funds. This project will link Pioneer Square to other public features that will be built as part of the Waterfront Seattle Program, including the new Alaskan Way, the park promenade along the water, the reinstalled Washington Street Boat Landing Pergola, a habitat beach south of Colman Dock, and a future open space opportunity at Pier 48. 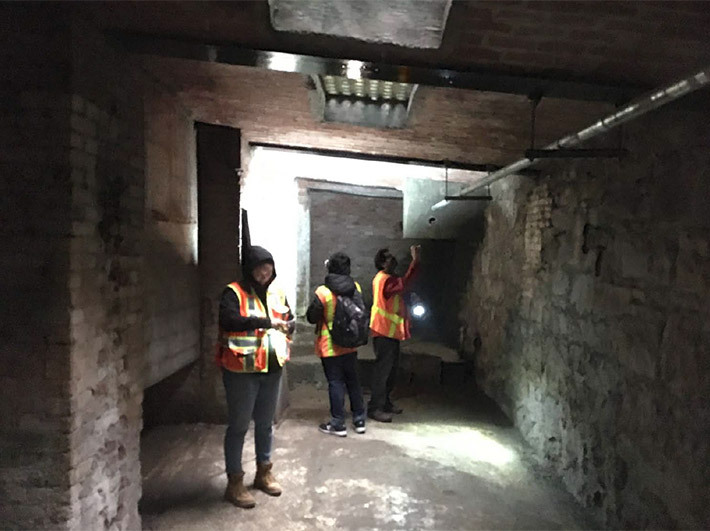 Click through the slider below to see more about these projects. 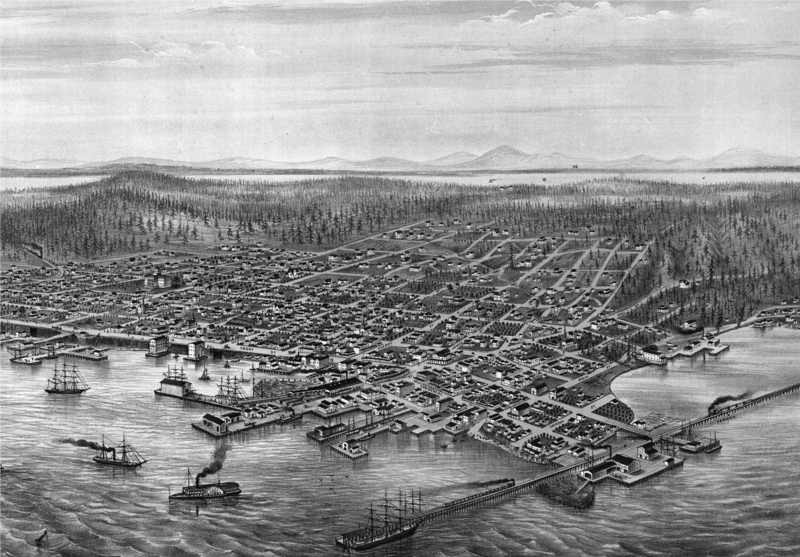 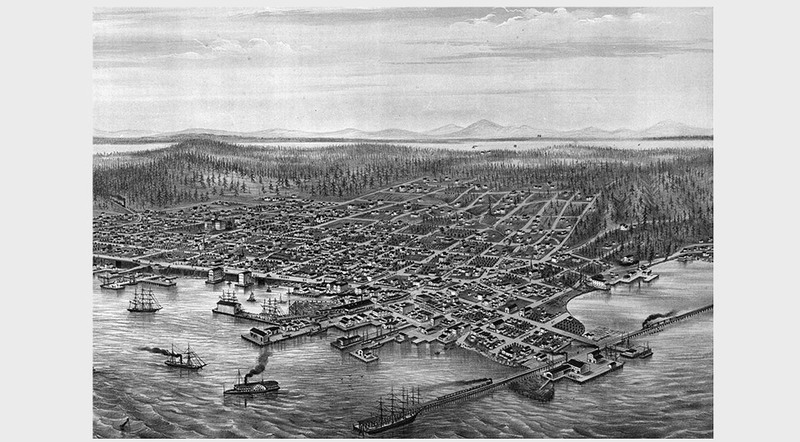 The land Pioneer Square now rests on has long hosted people – from Coast Salish communities to early settlers – whose daily rhythms were tied to a deep connection to the Sound. 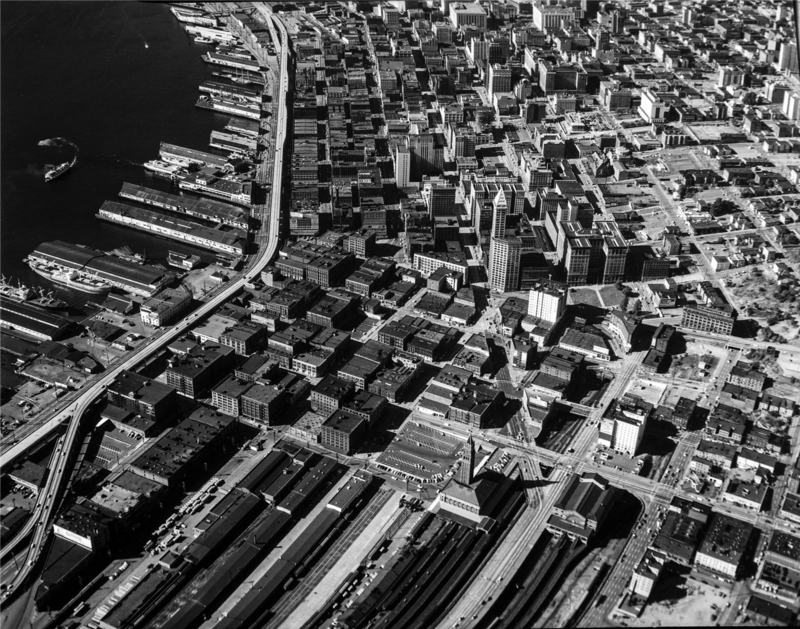 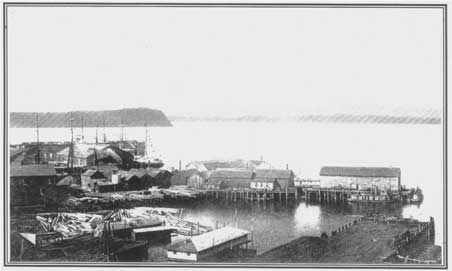 The introduction of the Alaskan Way Viaduct and the shipping industry’s move to containerized cargo diminished Pioneer Square’s historic connection to Puget Sound. 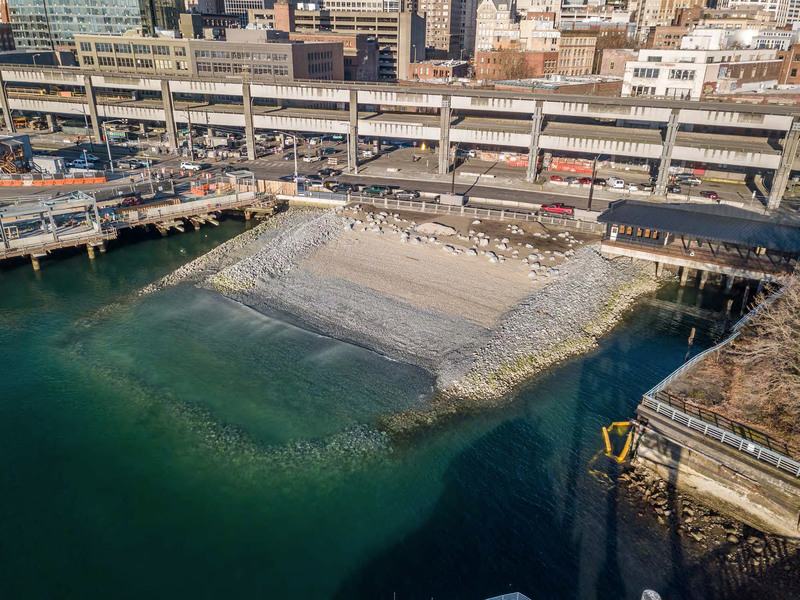 With the demolition of the Alaskan Way Viaduct, the neighborhood and city want to ensure that the bond between water and land is reestablished. 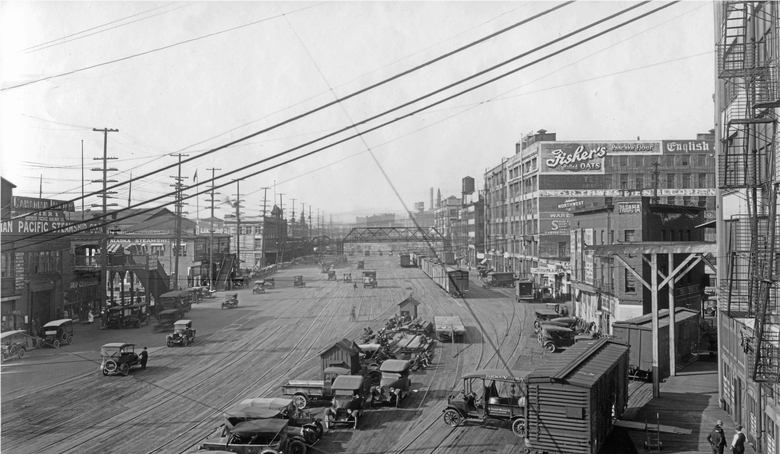 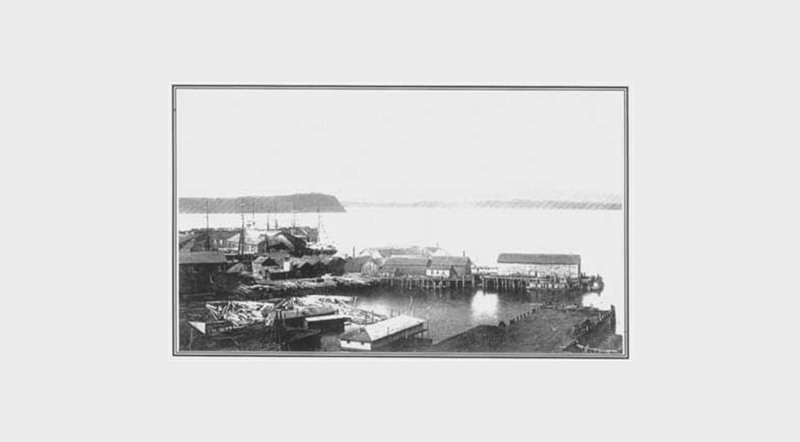 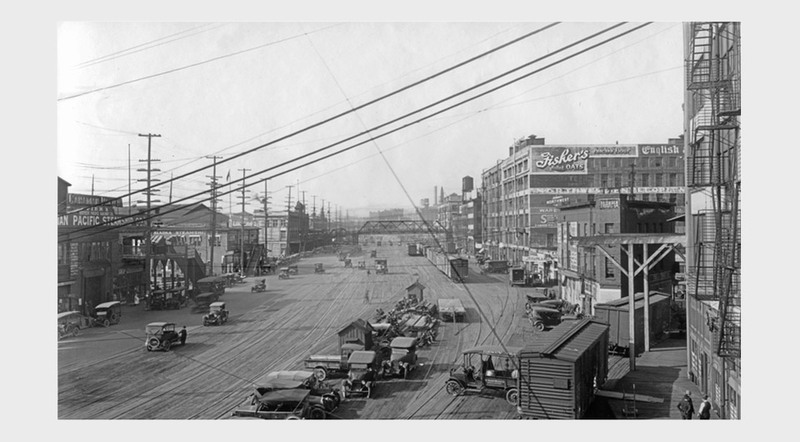 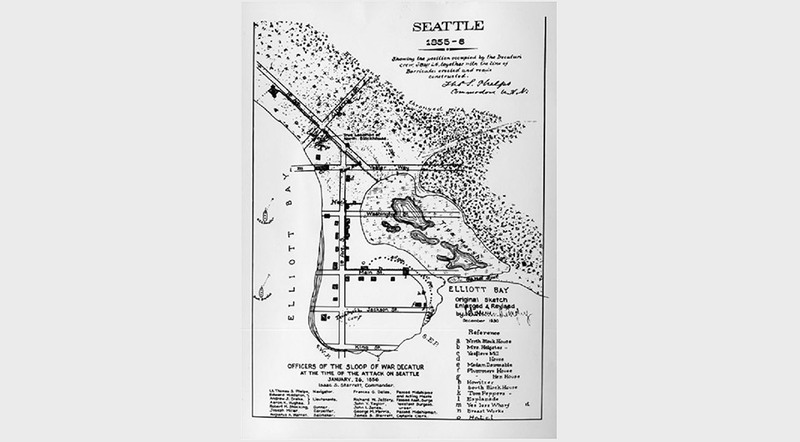 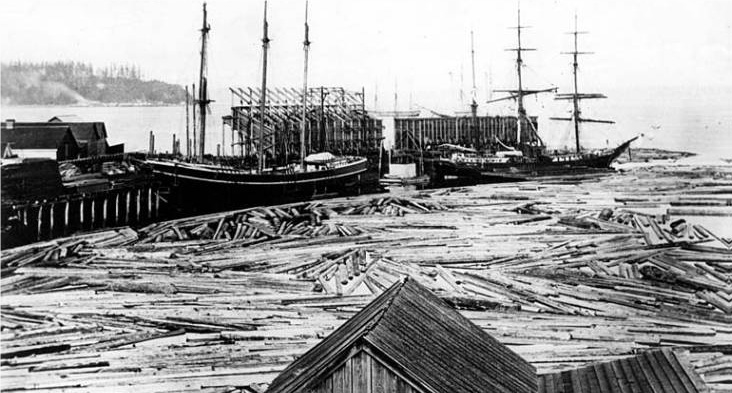 Click through the slider below for historic images of connections between the district and the waterfront. 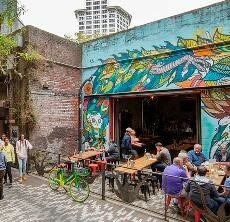 These east-west corridors knit past and present, open space and commerce, and intimate and expansive spaces together. 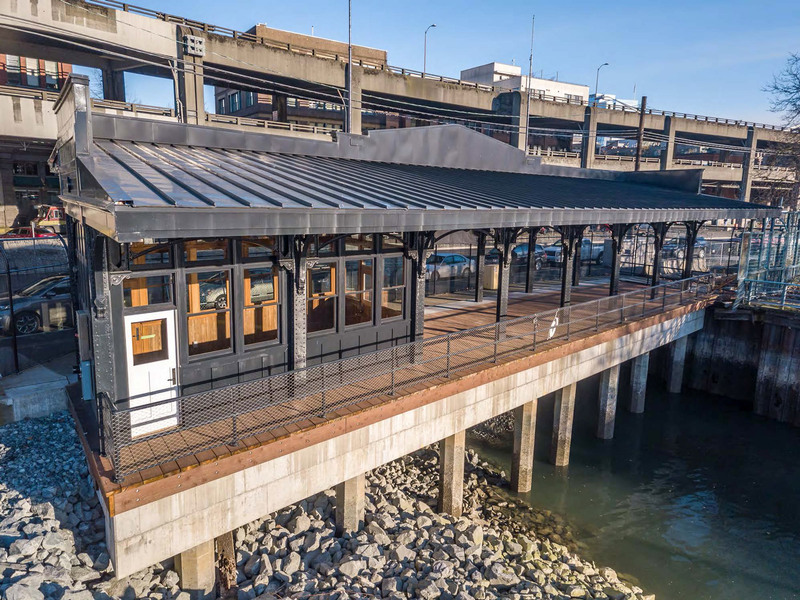 This corridors, once woven together, can mutually strengthen one another, inviting waterfront tourists into the district, underground tour attendees into Occidental Park, and diners out to the habitat beach to watch the sunset. 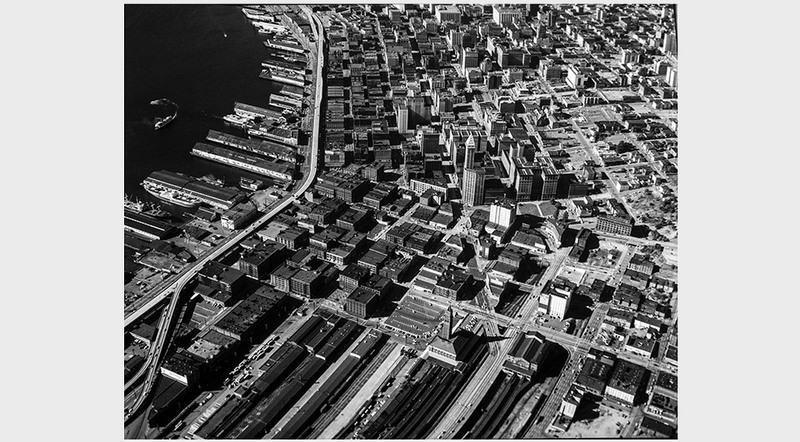 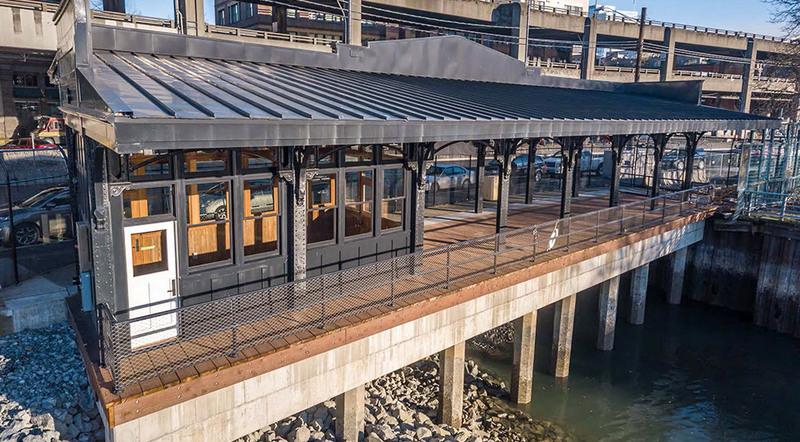 The opening of the SR 99 tunnel, the demolition of the Alaskan Way Viaduct and construction of both the 20-acre waterfront park and Center City Connector streetcar means that the ways people access the neighborhood will change significantly over the years. 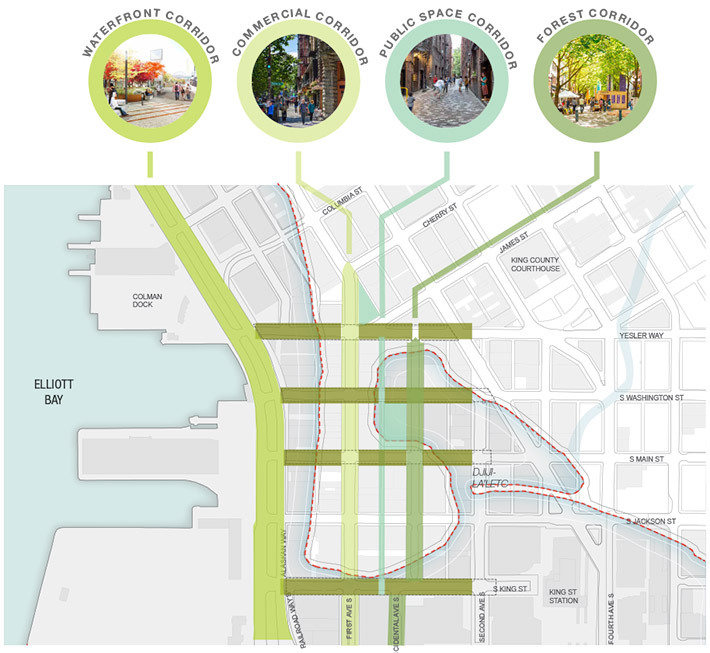 To begin planning improvements, we looked at the current conditions and expected future conditions of Pioneer Square, considering the other elements of the Waterfront Seattle Program. 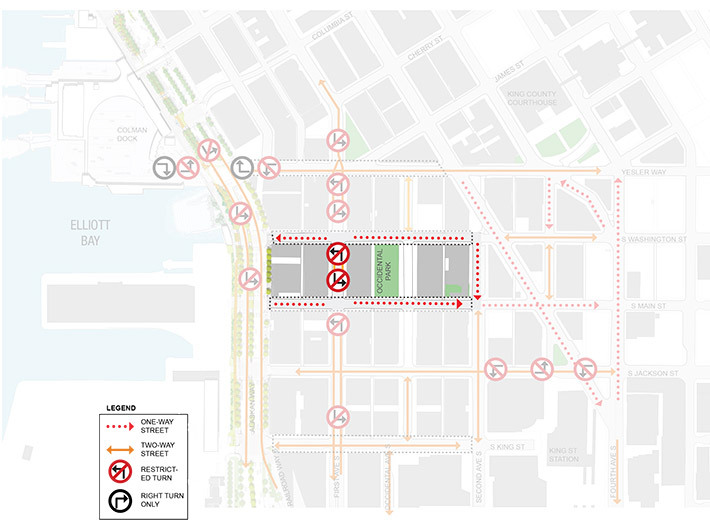 The maps below show the base conditions for Pioneer Square in 2025, assuming implementation of the new Alaskan way, the new waterfront park and the Center City Connector. 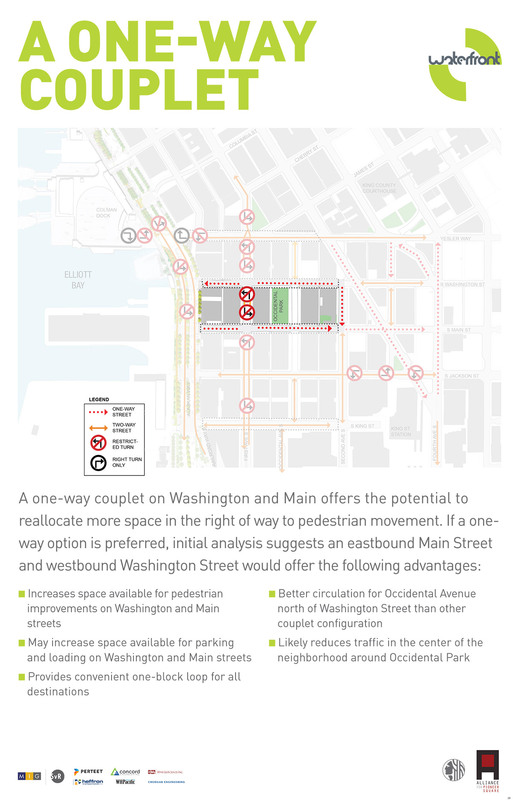 This does not include any revisions to the parking on the east-west streets. 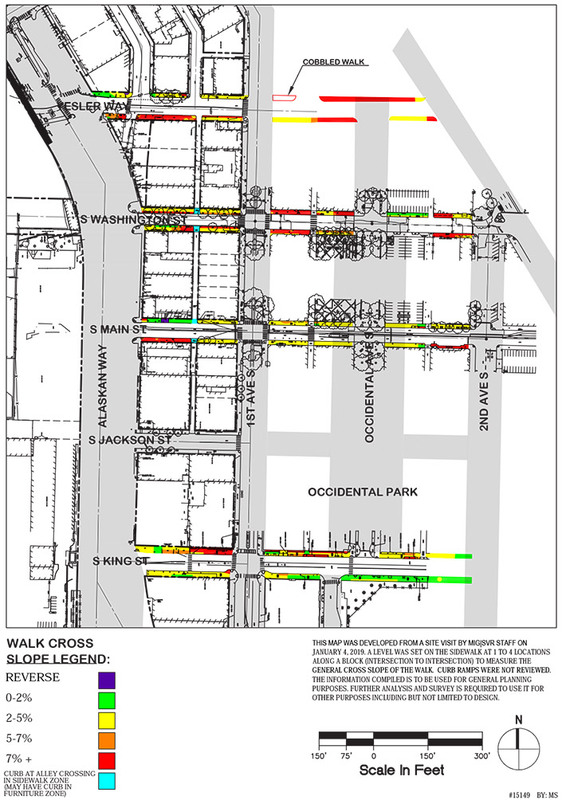 Many existing sidewalks in Pioneer Square are aging and have steep cross-slopes, where the sidewalk slopes away from the adjacent building-face. 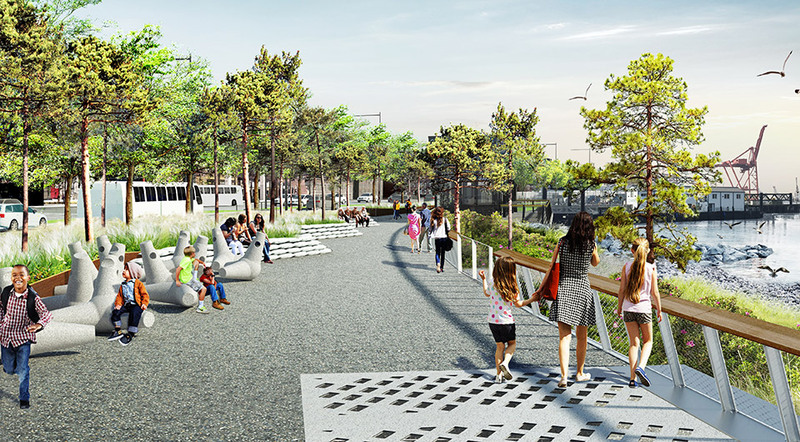 These slopes can create significant challenges for people trying to navigate the neighborhood in a wheelchair, with a walker or even a stroller. 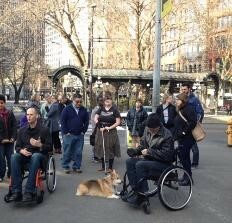 Sidewalk cross-slopes of more than 2% exceed the guidance from the Americans with Disabilities Act (ADA) on travel path cross-slopes. 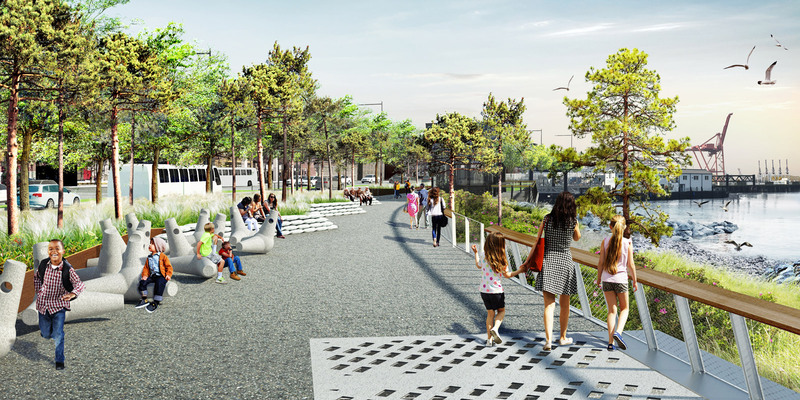 We're considering designs that create more accessible paths of travel for pedestrians on certain blocks where cross-slopes are steep. 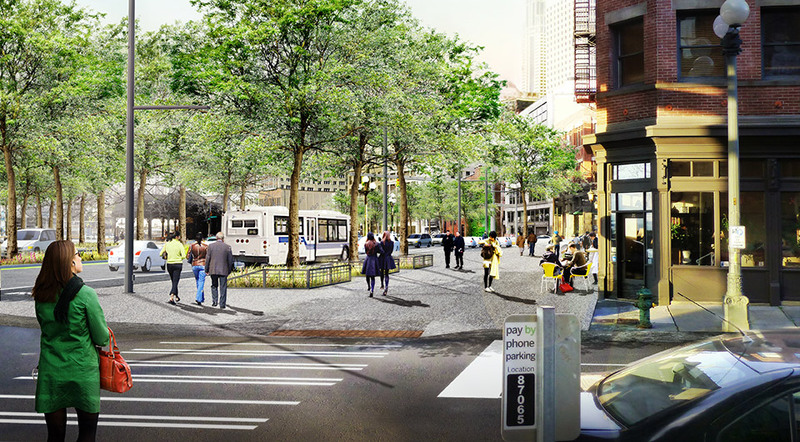 Areaways are open spaces that exist underneath sidewalks, or between streets and adjacent buildings. 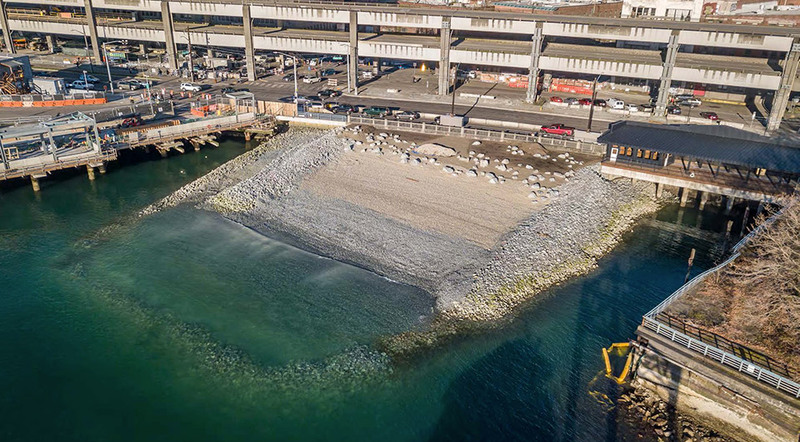 Areaways present unique challenges for vehicle loading, addressing cross-slopes, working with prism glass and other technical considerations. 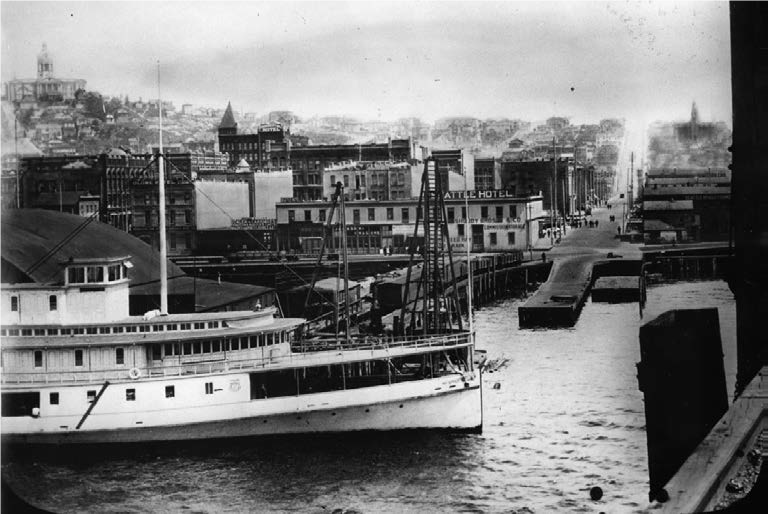 This means areaways are often costly to work in or around. 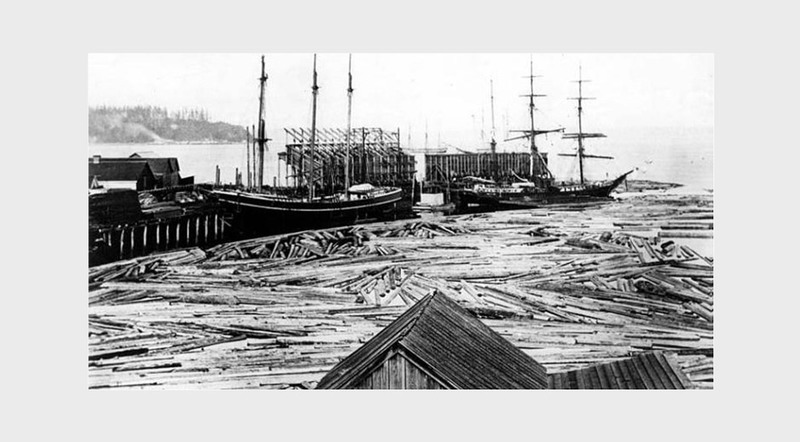 Pioneer Square has many historic, culturally-significant areaways that are protected from being filled in. 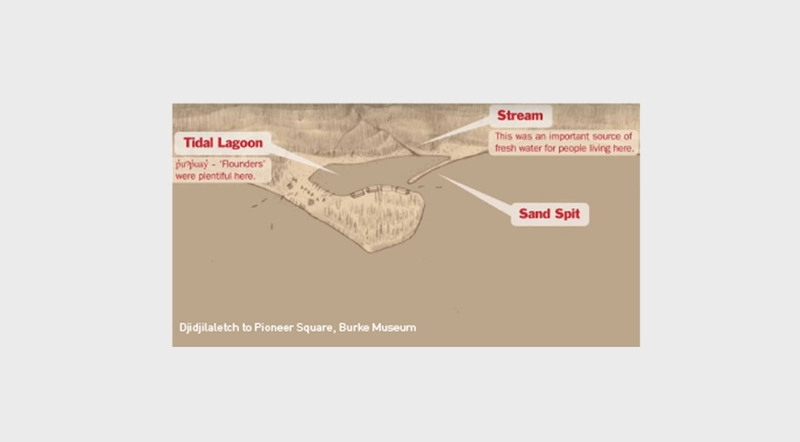 With the limited funding available, we are considering designs that avoid impacts to these protected resources and focus improvements on the surface conditions where they will have immediate impacts. 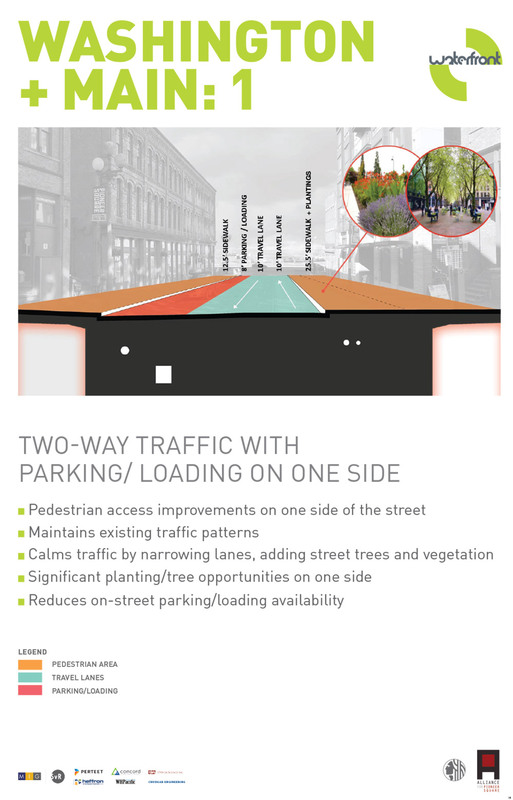 Strategy 1: Build extensions from the existing sidewalk into the street, creating a space that all users can navigate and which complies with federal law: a cross-slope of less than 2%. 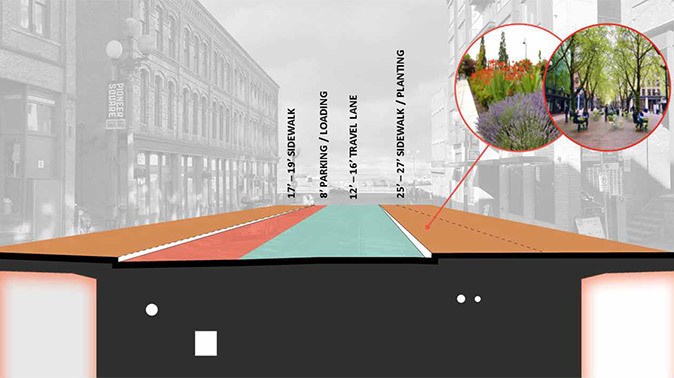 Strategy 2: "Stair step" the existing sidewalk. 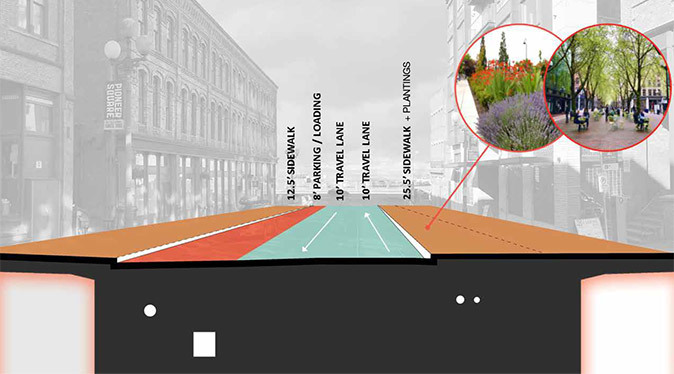 A strategy like this is used on Post Alley between Columbia and Marion streets, and on Occidental Avenue between Jackson and King streets. 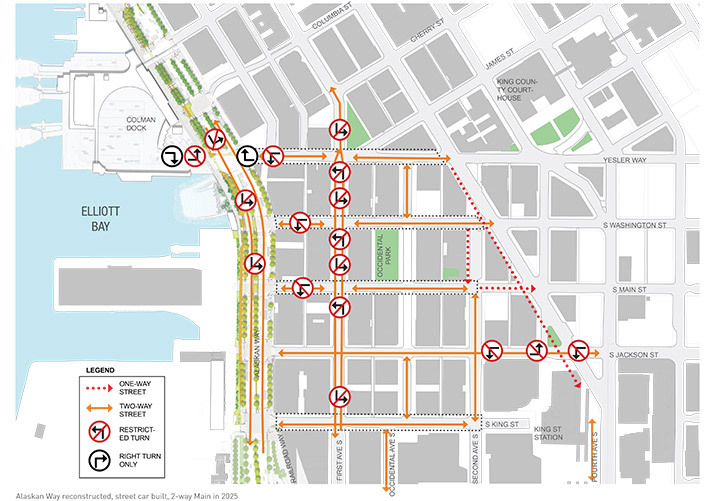 Feedback from our Sounding Board suggests that this is not a preferred strategy. 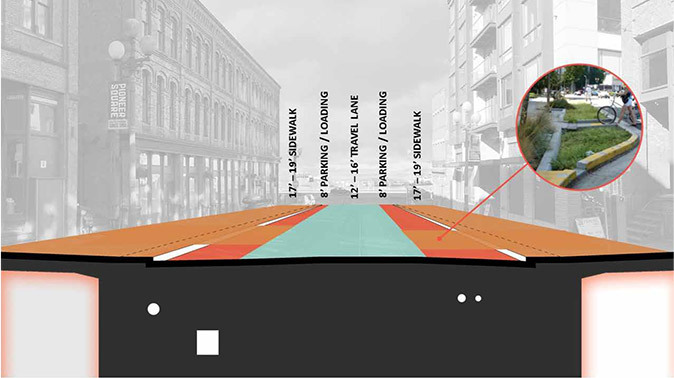 Strategy 3: Rebuild the cross-section of the right of way completely. 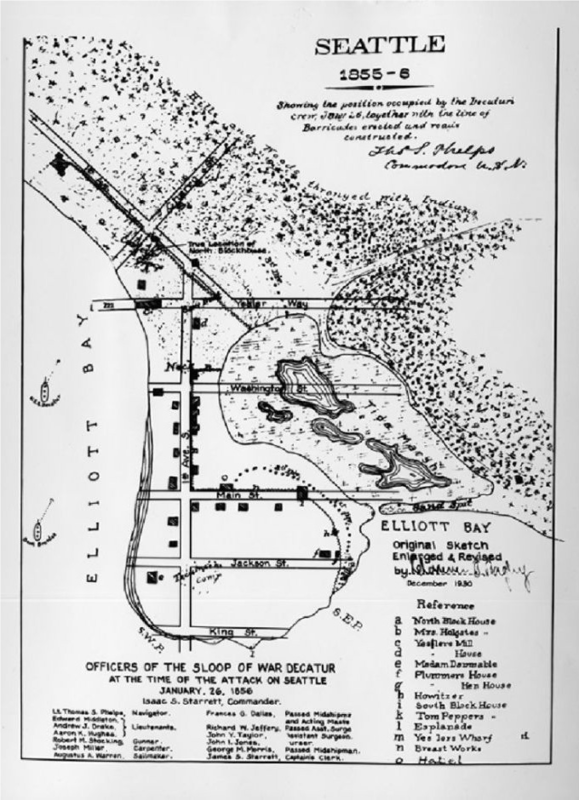 This option is more expensive and may also necessitate reconstruction of existing areaways. 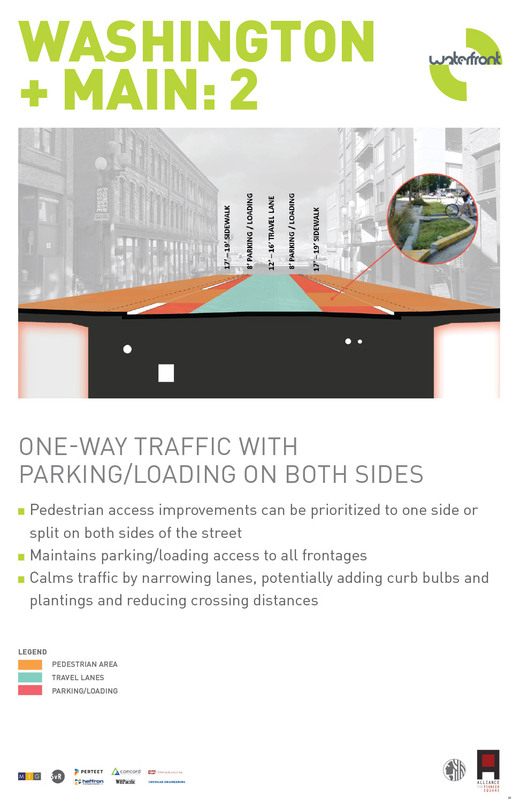 Strategy 4: Raise the existing travel lanes, connect them to the sidewalk and then allocate some of the "filled" streetscape to pedestrians. 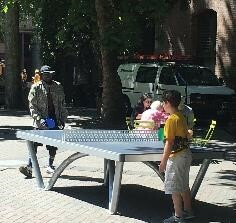 Main and Washington streets serve an important purpose in weaving together Pioneer Square. 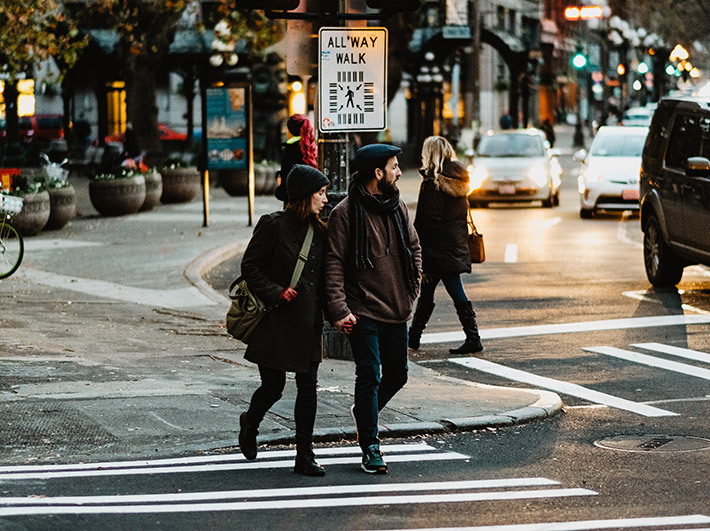 As non-arterial streets, there are great opportunities to improve the pedestrian experience on these streets, connecting existing open spaces like Occidental Park to the waterfront. 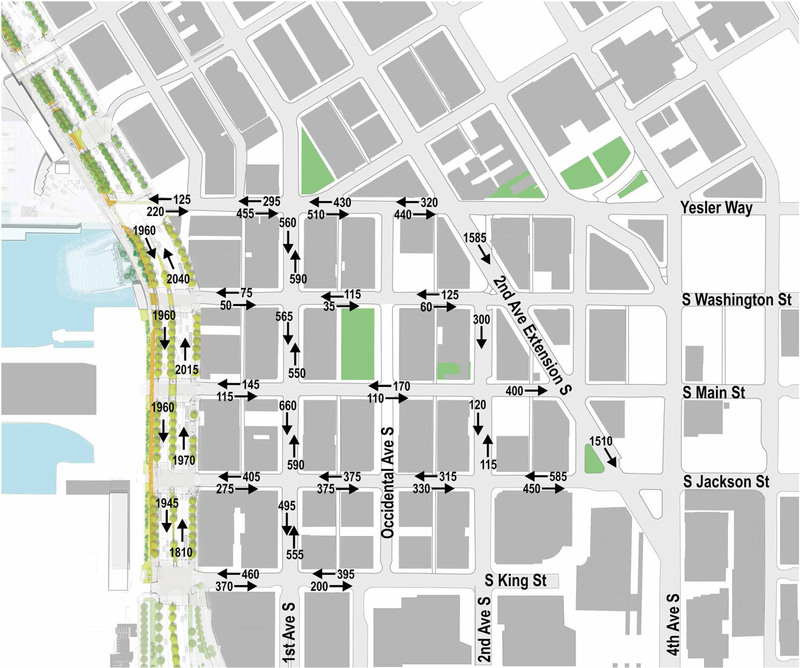 Yesler Way is an arterial street that will accommodate higher volumes of traffic than other east-west streets. 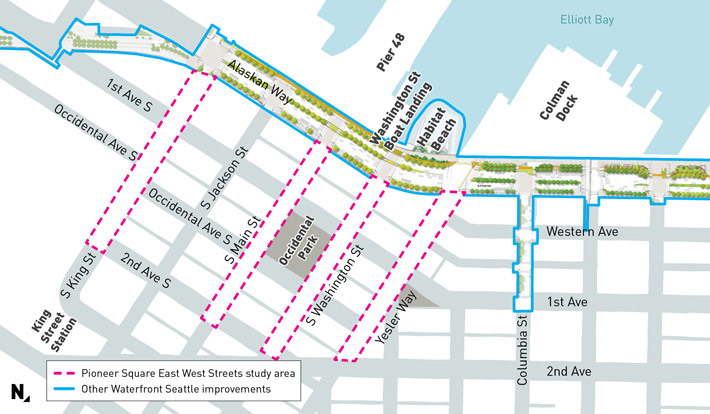 Yesler Way will also contain a protected bike lane in the future. 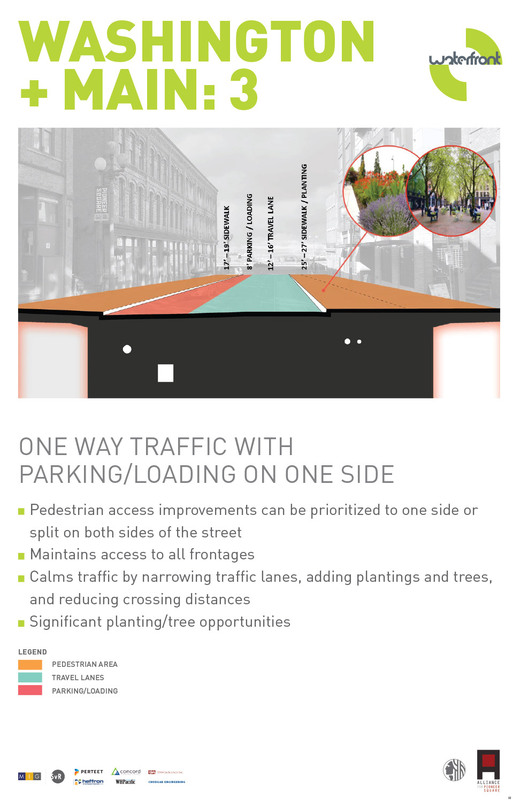 For these reasons, there are more limited, discrete options to add sidewalk extensions, curb bulbs and improve crossings. 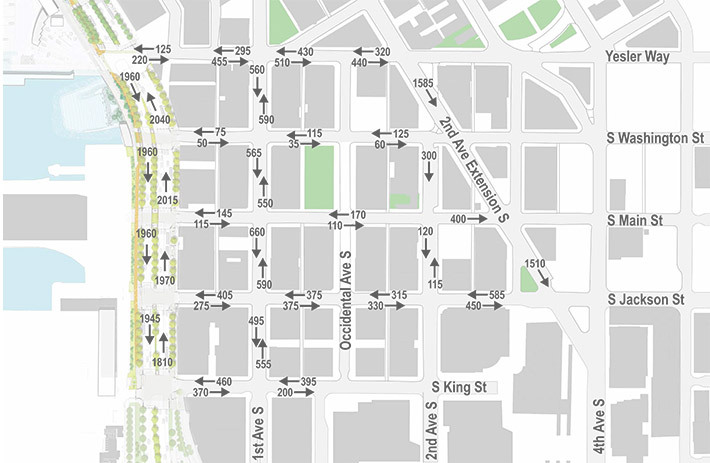 At the same time, the improvements accomodate Seattle Department of Transportation's (SDOT) future, two-way protected bike lane. King Street is an an arterial street that will accommodate higher volumes of traffic in its western blocks. 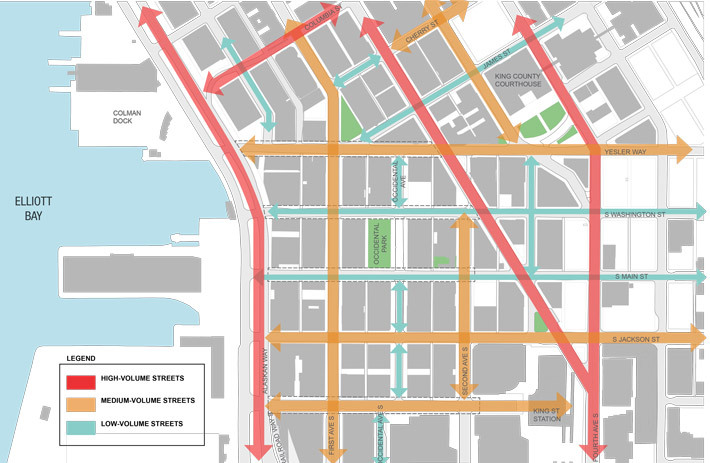 King Street is also a large-vehicle access route for bringing oversized loads (e.g. 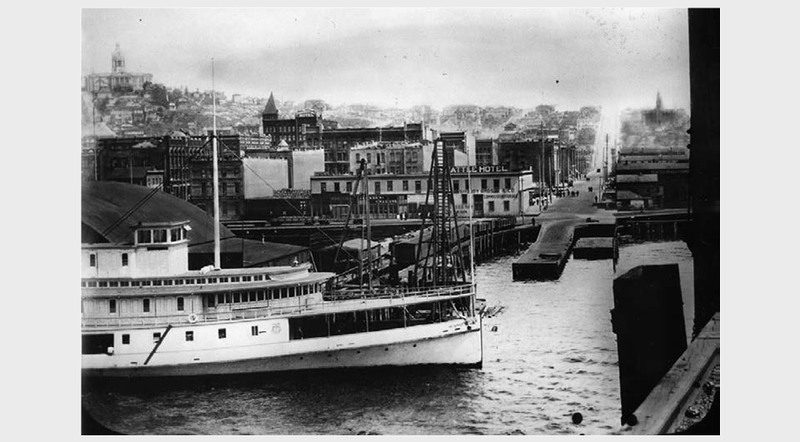 boats) to the stadiums. 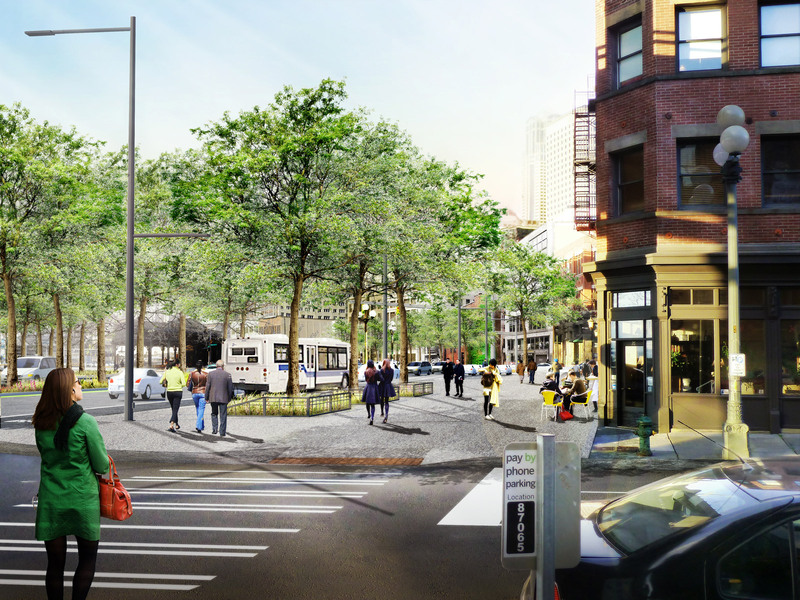 At King Street and Occidental Ave, an alternative could be to raise the intersection, creating a pedestrian linkage with Occidental Mall to the north. Over the coming weeks and months, we’ll be developing a preferred concept design. 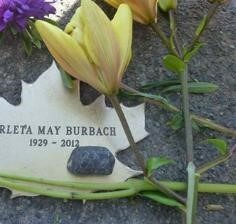 Thanks for visiting our online open house! 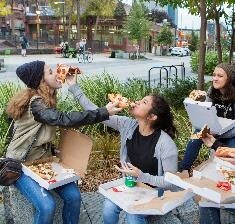 We’d love to hear your thoughts on the project.